Plantation shutters are louvred panels fixed either inside or outside windows and doors. They originated in America and the West Indies and date back to before the American Civil War. The term Ante Bellum means pre war and is used to describe a style of plantation shutters. 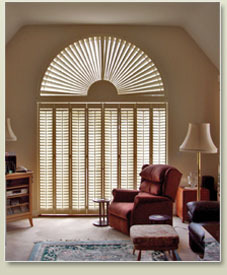 The louvre shutters offered by Countrywide Shutters are Ante Bellum. These are panels that have no louvers. They were originally installed in reveal boxes in pre Edwardian houses and were used a couple of times a year only, when the owners de-camped for the season. They were not designed to be opened and shut daily like our present designs and that is why so few remain today. Solid shutters vary in price according to the style used. A shaker style panel costs less to make than a raised panel in the Victorian/Regency style. Louvre shutters as with solid shutters vary in price according to the choice of product materials, including hinges and louvre controls. Why not go to the pricing page for an easy quick quote. A shutter panel may look like a door or kitchen unit panel but it has to live in a totally different environment. Normally a shutter panel fixed inside a window will have to endure some quite extreme variations in heat and humidity. Quite often it may have a radiator underneath it too, to add to the fun. In the UK the inside glass temperature reaches 55c in summer. Our shutters are tested in Countrywide (69c). The Pacific Range is made of Western Red Cedar. The timber is so durable and stable it can be left outside untreated due to its resin content. We don't have to laminate these shutters to prevent warping as cedar has a relatively straight grain and is very stable. Our engineered Tucson Range is made from a composite of many materials and is totally maintenance free. The finishes are carefully developed to be UV resistant and long lasting. They look almost too perfect when we install them but tone down very quickly and gain character. The wood finishes may darken slightly. What louver size should I choose? When making your louvre choice, consider the size of the window and the desired effect. Generally larger windows command a larger louvre size. The larger the louvre the more light. In America most shutters are made with 89mm louvres or larger but here in Europe we tend to generally choose smaller louvres such as 47mm or 64mm. 47mm is used a lot in bathrooms but also looks very good when painted white and used on café style installations in living room windows where the street may be very close by. If you have Georgian style windows with small windowpanes then we would definitely advise using the largest louver. How many shutter panels do I need in my window opening? Our smallest panel width is 200mm and widest is 550mm, although with larger louver panels we do sometimes go wider but void warp warranty with your permission. Generally a window looks best with 4 panels, two opening as pairs either way. A 3 window bay, however, will usually have 2 panels on the smaller side windows and 4 in the centre. All panels will open away from the middle. There are as many exceptions as there are norms. For instance, a long window with 3 panes of glass, i.e. ; 1600mm wide and 1000mm high, would have 6 panels; three folding either way or if you are only going to open them to clean the windows you could easily have just 3 panels. The Americans never open the shutters, only the louvers so design with large panels. We would not recommend hanging more than 3 panels from a single batten hinged together unless they were not going to be opened apart from window cleaning and were resting on the sill or door step. As the maximum recommended width of our panels is 550mm you may say that this equates to 3300mm maximum width but it would be asking a lot of the batten to hold panels of this width and weight without sagging at a later date. So quite a lot of common sense is needed to achieve a good installation. For partitioning or for large windows where tracking is needed at the top to suspend the panels you will really need an even number of panels or they will look odd and not hang from the track properly. Ideally 8 panels or 12 panels for very large openings is best and you can spilt them in the middle or take them all to one side. In summary, the window will normally dictate the number of panels. If the window is split into two halves you would either have 2 or 4 panels and it follows that if it is three panes then three or six panels will suffice. The vertical dividers of the windows are where the vertical stiles of the shutters should be ideally.